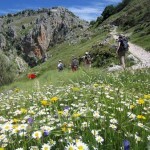 Over many years we have travelled and guided trips throughout Spain, principally here in the south, in Andalusia. Drawing upon this experience we have put together a selection of Sample Itineraries, focused on Gourmet, Outdoors and Culture, to introduce you to some of the wonderful sights, tastes and experiences of this extraordinary region. Tap into our local knowledge and expertise - and let us design and arrange your Spain holiday or tour. London may be bigger (twice, in fact), Rome more ancient (just the 2359 years head start), Berlin more imposing, and Paris more chic, but of the five big European nations, it is certainly Spain’s capital city, Madrid, that wins most plaudits as a liveable city, for visitors and residents alike. The history of the Camino de Santiago (“Way of Saint James”) dates back to the year 813 AD when the bishop of Iria Flavio informed King Alfonso II of Asturias that a tomb had been discovered containing the remains of the apostle Santiago (St James). It was really like having a good friend show you around their home town.